The opposition MP in question, Michal Szczerba of Civic Platform (PO), showed up to speak at the lectern with a note that read, “Free media in the Sejm.” He placed the note in front of him so that it would be visible in the TV broadcast. 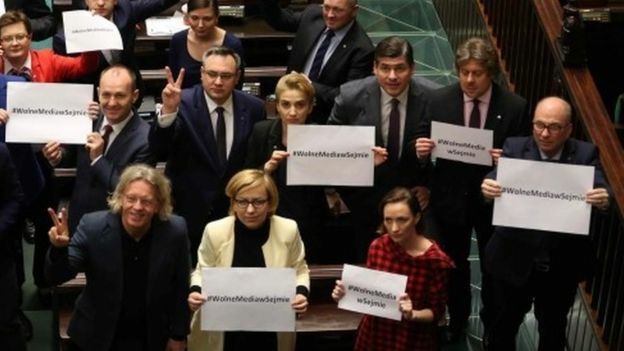 Opposition party Nowoczesna leader Ryszard Petru, center, and other parliamentarians hold cards reading “#Free Media in Sejm” during a protest at the plenary session in Sejm, the lower house of the Polish parliament, in Warsaw on Dec. 16. These events are typical of the PiS government. Shortly after coming to power, the government did not recognize Constitutional Tribunal justices approved in the previous Sejm term. Instead, PiS nominated its own justices and limited the court’s constitutional review powers in ways that the European Union criticized. PiS has also moved to take over the state news media, targeted state employees it considered disloyal and politicized local governments. This entry was posted in Essay and tagged Civic Platform (PO), Committee for Defense of Democracy (KOD), freedom of the press, Law and Justice (PiS), Mateusz Kijowski, Michal Szczerba, Poland, Polish parliament, protest, Ryszard Petru, Sejm, Solidarity. Bookmark the permalink.